The house on the hill - and what a hill. Cliff House overlooks Monsal Head, one of the most beautiful views in the Peak District. Sleeps up to 30 in 13 bedrooms with 8 bathrooms. Weekends from £3,750 to £4,250, full weeks from £6,000 to £6,250. For shorter stays please enquire. If fully occupied, price per person per night is usually between £29 and £47. Cliff House was built by a farmer for his two sons, in the mid-1800s. The house retains many original features, such as the oak flooring, and the very special Minton Tiles in the hallway. Cliff House is a solidly-built Victorian family house, in an incredible location. The houseis suitable for parties of friends or family, reunions, special celebrations and city escapes. It is also suitable for corporate and business use, or retreats. The main house sleeps up to 26, in flexible arrangement. There are 10 bedrooms, with 7 bathrooms, and the capacity to turn an upstairs sitting room into a sofa-bed (NB: this room does not have a door). One of the bedrooms is on the ground floor (a bonus for those wishing to avoid stairs), and up to 6 children can sleep with their parents in the same room (putting the house capacity at 30). The reception rooms of Cliff House are large and comfortable, and include a dining room (to seat 30) and a kitchen (with a table for breakfast). The drawing room is large, with big, squashy sofas and a wood-burning stove. There is also a heated boot room, in which to stash (and dry) all of your wellies and outdoor gear. Should you need extra bedrooms, there is a cottage next door which sleeps a further 6 people in 3 bedrooms. The house has a private, sheltered garden with terraces and BBQ area. There is parking for 10-12 cars. Cliff House is between the M1 and the M6, in the heart of the Peak District’s National Park – about 15 minutes drive from Chatsworth House. The nearest railway station is in Matlock, about twenty minutes drive away. 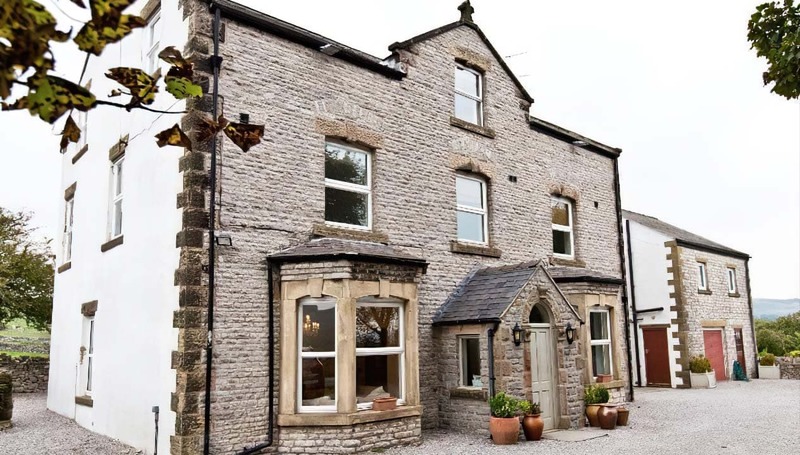 The nearest towns are Bakewell and Buxton (both can be reached on foot and bicycle, without the need for roads), and there are a choice of traditional, local pubs within walking distance. Cliff House is a walkers’ paradise, with some of the finest walking in The Peaks from right outside the door. One the most famous walks is the Monsal Trail (the house is only a 2 minute walk away from the newly opened tunnels). The Monsal Trail runs all the way from Bakewell to Buxton, perfect for walkers and cyclists. Cliff House is also near the pretty villages of Great Longstone (with its mysterious hill fort – Fin Cop), Little Longstone and Ashford in the Water (all with brilliant traditional pubs). Cliff House is an excellent base for lots of sport – there’s sailing or canoeing, fly-fishing, golf, riding, shooting…go-karting, Go-Ape, caving, mountain biking (you can hire the bikes)- all of which can be arranged by your hosts. Should you need a town, Bakewell is 5 minutes away by car, or the spa town of Buxton is 15 minutes away (lots of spa treatments available). If you feel in need of cultured beauty, Chatsworth House and estate is about 10 minutes away. Clay shooting on the Yeavely Estate. Lots of local hacks and trails, ponies and instructors available. At Bakewell Golf Club, Buxton and High Peak Club, and the Cavendish Club. We stayed here for a week in May, and it was lovely. There was a large group of use who stayed here, and it was a perfect size for us all. There are lovely places to go for walks as well. You wouldn't be disappointed if you stayed here. We spent a whole week at Cliff House with our guests to celebrate our wedding which took place in the chapel round the corner. The weather was superb which meant we could make full use of the beautiful garden and courtyard, taking in those amazing views. The location could not be bettered. Our cars sat on the drive as day after day we found different walks to do starting at Cliff House and always including a pub lunch. The house itself is stunning. Our guests felt like they were staying in a five star hotel and our honeymoon suite was magnificent with those wonderful views over the viaduct at Monsal Head. The spacious rooms and kitchen meant that we never felt under each others feet. The facilities were excellent and there was everything you could possible need. (except for a rubber mallet which the guy who brought the cask of ale from the local brewery expected us to have!) Peak Venues were also amazing. Very efficient and helpful. Nothing too much trouble. We visited three times before the week and Joanne, the housekeeper was really wonderful with us. Our guests have requested a yearly reunion at the house. We were so sad to leave. Just didn't want the week to end. Cliff House has left us with a life time of memories. An excellent weekend spent with a group of 28 fabulous ladies; impeccable accommodation, well equipped for every occasion. Greeted by the most helpful housekeeper who provided us with instructions above & beyond what was expected. A very warm & welcoming venue - highly recommended. An absolute pleasure dealing with Peak Venues - we'll be back. We booked this venue as one of the few places around that could take our party of 20+ people. It was absolutely perfect for our needs, we arrived a couple of days before Christmas and the house was lovely and warm ready for us, while we were in the process of getting cases in and being shown around by the house keeper one of the owners turned up with a crate of wine for us which was a nice surprise. The house came with everything we needed including a very well stocked kitchen (often in my experience a short coming of a holiday let, they had pint glasses and sharp knives, unheard of!). All in all I would recommend this place as a perfect place to get away from it all for a larger group. The local pubs were excellent (The Pack Horse particularly), the scenery and walks ideal for those who want a bit of fresh air or a more serious walk. Bakewell is a pleasant 4 mile walk away via the Monsul trail. We stayed at Cliff House near the Monsal Trail for 3 nights, and it was fantastic. The house exceeded our expectations. It was in immaculate condition, the heating was on when we arrived, and there was a Christmas tree with lights on! The rooms were all very spacious and luxurious. The top floor master bedroom was like a 5-star hotel suite! The kitchen was incredibly well stocked - no need to bring your own pots and pans! We were met by Theresa who was lovely and made us feel very welcome and looked after. Literally nothing but great things to say about Cliff House and the Peak Venues Team. Thanks for an amazing experience - we shall return! We stayed here for a long weekend as an extended family (21 adults, 7 children). The house and adjoining cottage easily coped with all of us, with a combination of family, double and twin rooms - most with en-suite facilities. Parking for at least 8 cars was easy and the living spaces and kitchen are all designed to handle such a large group comfortably. Would definitely recommend this for anyone looking for a large and comfortable property with all modern facilities (dishwasher, American style fridge freezer etc) provided. Stayed here for a long weekend with my family. It's a fantastic set up with most rooms benefiting from ensuites. There are 4 bigger family rooms which are great for parents sharing with kids. The communal space it's ideal for a large party with a great dining space. We used caterers from the dinner party company to serve a three course meal which was fantastic and we easily seated 23 in the dining room. The venue itself is really nicely decorated and kitted out with comfy beds and modern bathrooms and lovely showers. It's all been so well thought through. The venue itself is set ideally at Monsal head and you can walk into Bakewell along the Monsal trail. Great pubs within walking distance and venue has stunning views over the viaduct and fields behind. Peak venues who manage this property are a slick operation. Really efficient and good to deal with. Highly recommend! I want to go back.